Our founder, KL Kent built a moving business that was based on his personal values of honesty, care and service. Nearly 70 years on, these values continue to be at the heart of our business, so we are honoured, (and admittedly proud) to have earned countless domestic and international awards and industry and client accolades for our exceptional customer service and delivery. 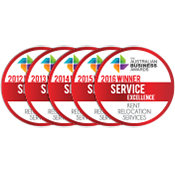 However, as appreciative as we are to have earned these, the validation of our success that matters most to us are the hundreds of contracts that we are awarded and renewed each year across most every industry sector in Australia and abroad. With an average contract length of 10+ years, and many over 25, (including renewals), it is this year-on-year ability and continued commitment to deliver successful outcomes for our partner clients that matters most. If you’d like to learn more about how we can guarantee your relocation, removals and storage success now, and for years to come, contact us to speak with a Relocation Specialist today.